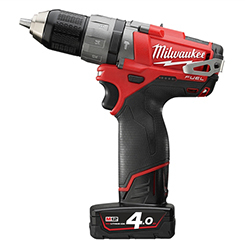 MILWAUKEE is a global leader in manufacturing heavy duty power tools, hand tools and accessories. Long-standing in the tool industry, they have been operating since 1924 and in recent years taken the Cordless market by storm with their own ‘REDLITHIUM’ next generation of Lithium-Ion battery. Their aim is to produce the best heavy-duty electric power tools and accessories available to the professional user. My Tool Shed are continually updating their range of MILWAUKEE products to ensure we offer the best in the business. The opportunity to work with the latest technologies lends great benefits to the user. Their ‘PowerState’ Brushless Motors operate with more runtime, over 60% more torque and a longer motor life. A worthwhile investment for a tool that goes much further and delivers every time. Look for the ‘Fuel’ logo to get your hands on one of these clever machines. Another important technology to note is the ‘One-Key’; it has the ability to wirelessly connect your power tool to a smart phone, customize, track and manage its’ performance and even location, an ideal feature for the work site industry. Feel complete buying confidence with this brand, as you can now register any MILWAUKEE Fuel product online for an extended 5 Year Warranty.